John Stavast was born on May 5, 1926, in Denver, Colorado. He enlisted in the U.S. Army Reserve on March 20, 1944, and entered active duty with the U.S. Army Air Forces on November 17, 1944, receiving training as a B-29 Superfortress gunner. After deploying to Europe, Sgt Stavast served as an infantryman with Company A of the 117th Infantry Regiment, before serving as a B-17 Flying Fortress gunner with the 92nd Bomb Group in England. He received an honorable discharge on August 18, 1946, and then joined the Air Force Reserve on November 7, 1947, serving until going on active duty to enter the Aviation Cadet Program of the U.S. Air Force on January 13, 1950. Stavast was commissioned a 2d Lt and awarded his pilot wings at Reese AFB, Texas, on February 10, 1951, and then completed B-26 Invader Combat Crew Training before attending Pilot Instructor Training from April to September 1951. Lt Stavast served as a flight instructor with the 3615th Pilot Training Squadron at Craig AFB, Alabama, from September 1951 to November 1952, and then with the 3561st Pilot Training Squadron and 3560th Air Base Group at Webb AFB, Texas, from November 1952 to May 1954. His next assignment was as an Aircraft Intercept Controller with the 527th Air Control & Warning Group at Fukuoka, Japan, from May 1954 to May 1955, followed by service as a flight instructor with the 6035th and 6025th Flying Training Squadrons in Japan from May 1955 to March 1956. Capt Stavast next completed Tactical Reconnaissance training from March to June 1956, followed by service as an RF-84 Thunderflash and RF-101 Voodoo pilot with the 18th Tactical Reconnaissance Squadron at Shaw AFB, South Carolina, from June 1956 to May 1959, and then deployed with the same squadron to Laon AB, France, from May 1959 to November 1960. During this time, he deployed in support of the Lebanon Crisis from August to November 1958. He served on the staff of the 66th Tactical Reconnaissance Wing at Laon AB from November 1960 to September 1962, and then served with the 4411th Combat Crew Training Group at Shaw AFB from September 1962 to August 1964. 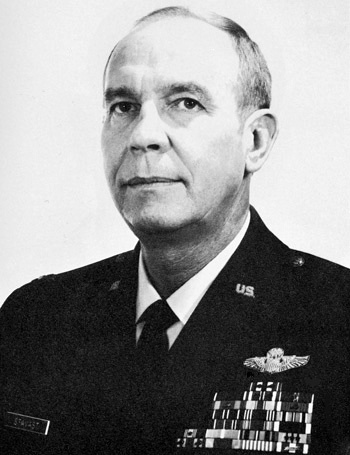 Maj Stavast attended Air Command & Staff College at Maxwell AFB, Alabama, from August 1964 to June 1965, followed by service on the staff of Headquarters Tactical Air Command at Langley AFB, Virginia, from July 1965 to January 1967. After completing RF-4C Phantom II Combat Crew Training, he served with the 11th Tactical Reconnaissance Squadron at Udorn Royal Thai AFB, Thailand, from June 1967 until he was forced to eject over North Vietnam and became a Prisoner of War on September 17, 1967. After spending 2,006 days in captivity, Col Stavast was released during Operation Homecoming on March 14, 1973. He was briefly hospitalized to recover from his injuries at March AFB, California, and then attended Air War College at Maxwell AFB from August 1973 to July 1974. His final assignment was at Bergstrom AFB, Texas, where he retired from the Air Force on July 1, 1980. John Stavast died on July 3, 2004, and was buried at the Fort Sam Houston National Cemetery in San Antonio, Texas. For gallantry in connection with military operations against an opposing armed force as an RF-4C Aircraft Commander near Hanoi, North Vietnam, on 17 September 1967. On that date, Colonel Stavast led a flight of two RF-4C aircraft on a reconnaissance mission into one of the most heavily defended areas ever to confront United States combat aircrews. In spite of a surface-to-air missile/anti-aircraft artillery attack that damaged his aircraft, Colonel Stavast continued to his assigned target, and with his wingman obtained one hundred per cent coverage of all assigned targets, as well as several bonus targets, prior to having to abandon his disabled aircraft while over hostile territory. By his gallantry and devotion to duty, Colonel Stavast has reflected great credit upon himself and the United States Air Force.